The central distinguishing feature of Kinesis keyboards is that the alphanumeric keys are separated into two concave, bowl-shaped wells, with smaller, subsidiary, thumb-operated keypads for operations like shift, space bar, delete, command, option, and control. This patented design is claimed to minimize stress on hands, wrists, and shoulders that users experience from heavy use of conventional computer keyboards. While it appears very funky-looking at first, Kinesis reports that within a couple of hours practice, most new users are at 80% or more of their previous speed and accuracy. Within 2-3 days, speed and accuracy are usually 90-105%. Within 3-5 days, new users are typically up to full speed with both alphanumeric typing and using the thumb keys and arrow keys for editing. I'm not a touch typist, but after a few hours, I found myself getting used to the Kinesis' unorthodox layout and very much enjoying the comfort. The Kinesis design resulted from two years of research and testing and has proven itself in a decade of commercial use. The contoured keyboard was designed not only to reduce the known risk factors associated with repetitive stress injuries but also to provide a more comfortable platform than other keyboards, improving productivity as well as typing comfort. I found the Kinesis unit I tested surprisingly relaxing and comfortable to use. The contoured key wells minimize the need for long finger movements and stretching - even for the numbered function keys that live on the far side of the key wells. Giving the thumbs more work to do seems like a logical way of spreading typing stresses more evenly. The mechanical key switches used by Kinesis have a pleasantly light touch and smooth action, although my personal preference would be for even shorter travel, more like the keys on PowerBooks and iBooks. Quality of construction and materials on this keyboard seem first rate, as befits a premium-priced unit. The Kinesis Advantage keyboard is usable with both Macs and PCs, which is convenient for folks who have to use a PC at work but have their own Mac at home. This is not a minor issue, because it would be awkward to switch back and forth between a standard keyboard and the Kinesis on a regular basis. The Advantage is shipped from the factory configured for the Macintosh. Users can instantly change the configuration to a Windows or non-PC layout. All Advantage keyboards models can also switch on the fly between QWERTY and Dvorak key layouts. Some of the Advantage keyboard's thumb keys are cross-platform labeled. There are two Mac Command keys (= PC Control), which is a convenience. The Backspace key performs the Mac Delete function and is operated by the left hand rather than the right, as is the Mac norm. The Delete key works as Forward Delete in Mac mode. The Enter key performs the Mac Return key function, and the Space key is the Space key in both modes, operated by the right thumb. Page Up, Page Down, Home, and End thumb keys are self-explanatory. This probably sounds more confusing than it really is in practice. Personally, I adapted fairly quickly, although the Delete/Backspace key on the left tended to trip me up a bit. The Kinesis keyboard has a compact footprint, since it has no dedicated numeric keypad. Instead, a numeric keypad is embedded in the right hand key well, a function you switch on and off by toggling Num Lock or Shift + Num Lock. I rarely use numeric keypads except for the handy Enter key, so I'll have to take their word for it that one would adapt to this arrangement. You use the same fingers as with a conventional keypad. The Advantage Pro USB (advanced programmable) for Mac & PC supports advanced programming features. Programmability allows users to customize their keyboards to be more comfortable and more productive. The user can move, copy, or "kill" any key action (using remapping) or save keystrokes by storing them in the keyboard's memory (using macros). In addition, all Kinesis contoured keyboards support a foot switch that allows the user to reallocate commonly used key actions from the hands to the feet. 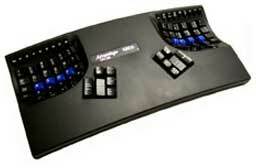 Each keyboard can support up to two single-action foot switches or the new triple-action foot switch. Using Kinesis programmable contoured keyboards, single and triple foot switches can be set to trigger any keyboard action, such as Esc, Tab, Enter. To summarize my impressions of the Kinesis keyboard, I liked it and found it quite comfortable to type with. I expect that I could become used to it very quickly and that my speed would at least equal what I can manage on a conventional keyboard. It is a bit pricey compared with more conventional ergonomic keyboards, but independent test results indicate that for someone with typing pain or typing injury especially, it could be money well-spent. Compatible with both Mac and PC operating systems. Instant configuration for Mac, Windows, and non-Windows PC operating environments, includes Mac and Windows legended keys. Supports triple action foot switch. Automatically switch between Mac and PC operating systems.